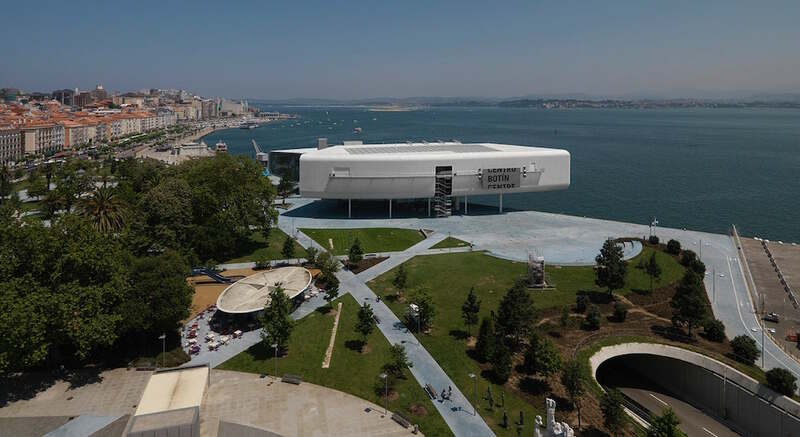 Unlike the Guggenheim Bilbao and the Centre Pompidou Málaga (Spain’s most notable and most recent museum projects, respectively) Centro Botín was completely privately funded. It was commissioned by the Botín family, whose Banco Santander is the largest bank in Spain. The Fundación Botín funded the center’s €80 million construction cost and will provide an annual budget of €12.5 million. 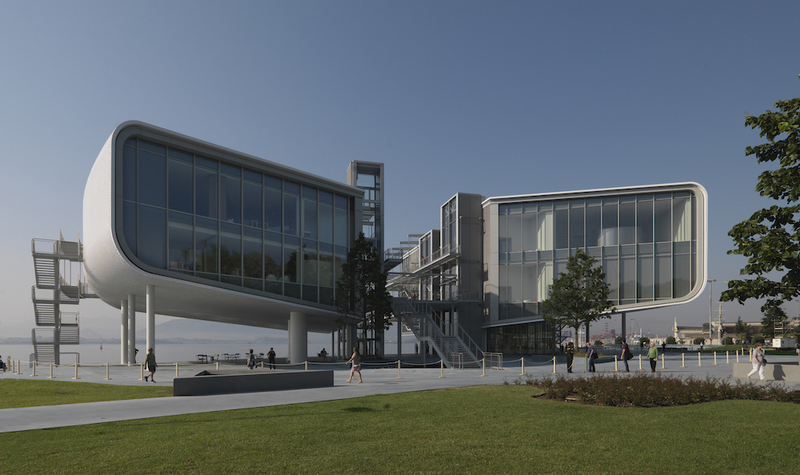 Centro Botín is Renzo Piano’s first building in Spain. The 10,285 square-meter structure is comprised of two wings. 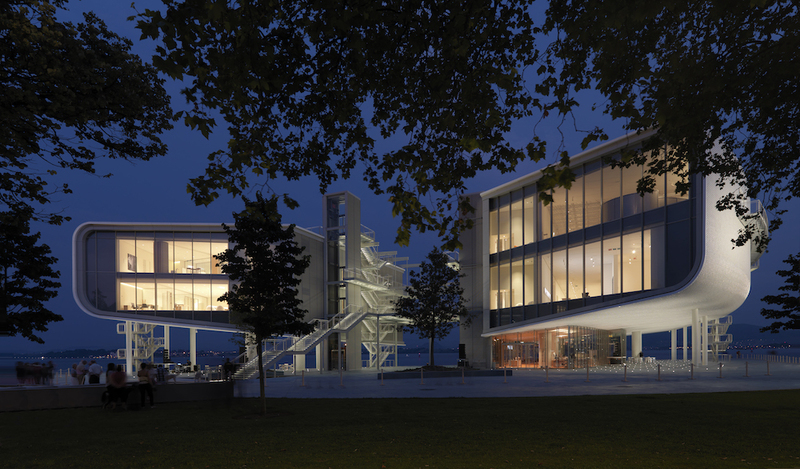 The west building contains 2,500 square meters of galleries on two floors, and the east building contains classrooms, an auditorium, restaurant, shop, and rooftop terrace. The two wings are separated in the middle and raised up above the ground to extend views from the nearby Jardines de Pereda to the bay. About €16 million of the construction cost was to redevelop the park adjacent to the museum. The building site was formerly a parking lot, separating the Jardines de Pareda from Santander Bay. 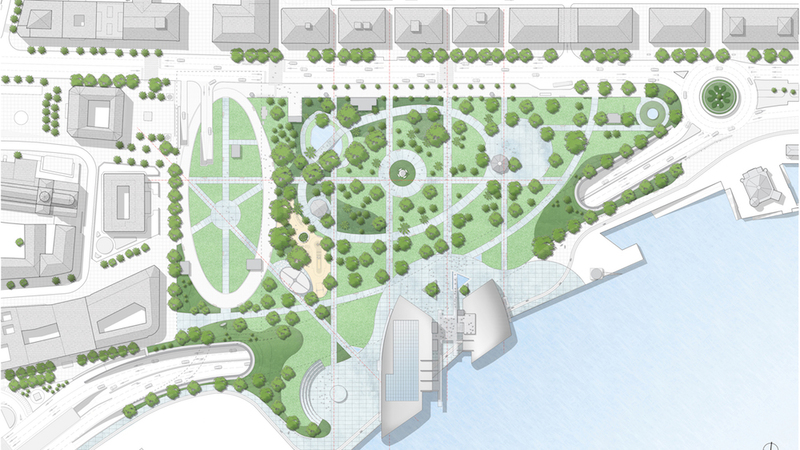 By moving a road and a parking structure underground, the project doubled the size of the park, tripled the amount of green space, and reconnected the city to the bay. The park also gained an amphitheater, which functions as an open-air cinema with a huge screen on the museum’s west façade. 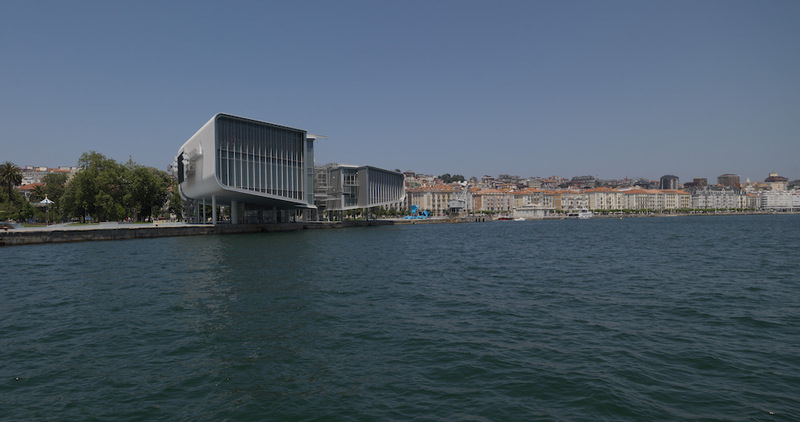 Centro Botín is characteristic of other Renzo Piano museum buildings (he has designed more than 25 to date) with natural light and a carefully balanced relationship to the surrounding environment. The exteriors are clad with 270,000 ceramic plates that reflect the colors of the sea and sky. 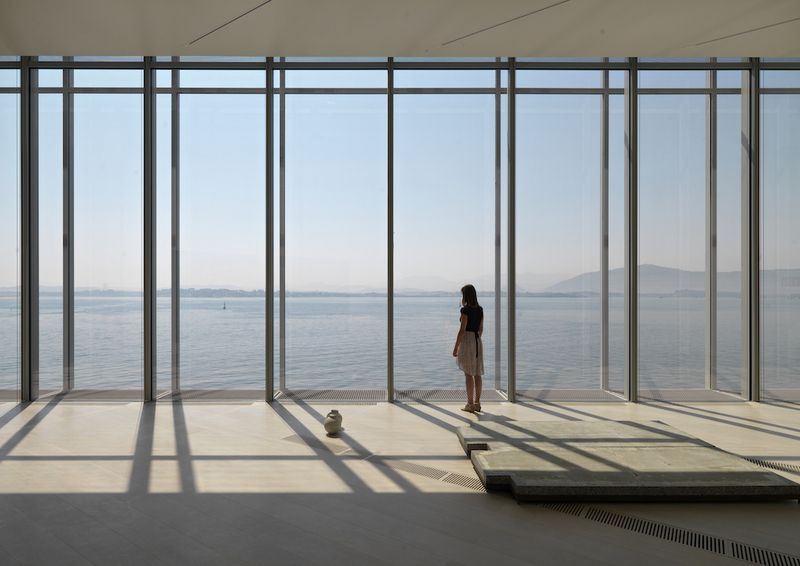 Inside, ventilation systems and lighting tracks are exposed, and full-height windows provide extraordinary views onto the bay. Before Centro Botín opened, it gave memberships for unlimited free admission to about 80,000 locals and announced a schedule of free programs in the park and amphitheater. The museum was inaugurated by King Felipe VI of Spain, and also opened a permanent sculpture installation in the Jardines by the Spanish artist Cristina Iglesias. While Centro Botín is a major cultural development, it does not aim to replicate the “Bilbao effect” of mass tourism and blockbuster exhibitions. Its primary missions are research, training, and dissemination. It has a research partnership with Yale University, and the exhibitions program has a particular focus on researching and cataloguing Spanish drawings from the 16th century. 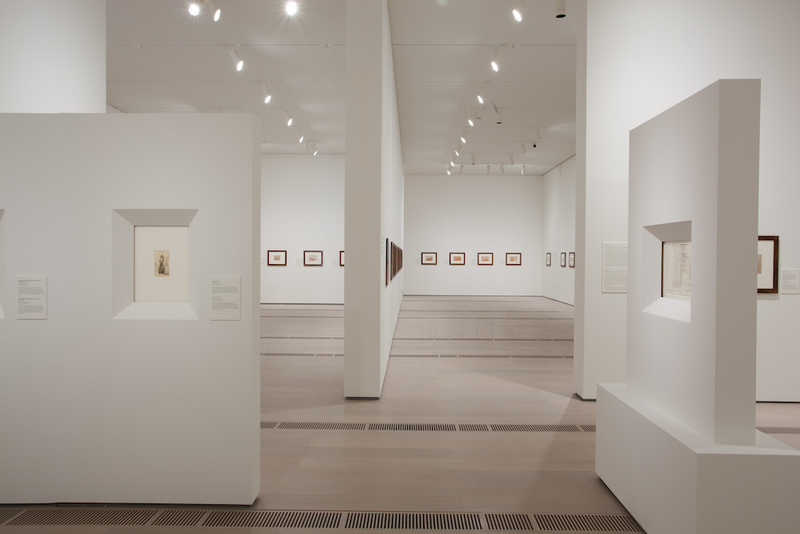 One of the museum’s inaugural exhibitions was a group of 80 drawings by Francisco de Goya on loan from the Prado. In addition to changing exhibitions, the center will show works from the collection of the Fundación Botín.